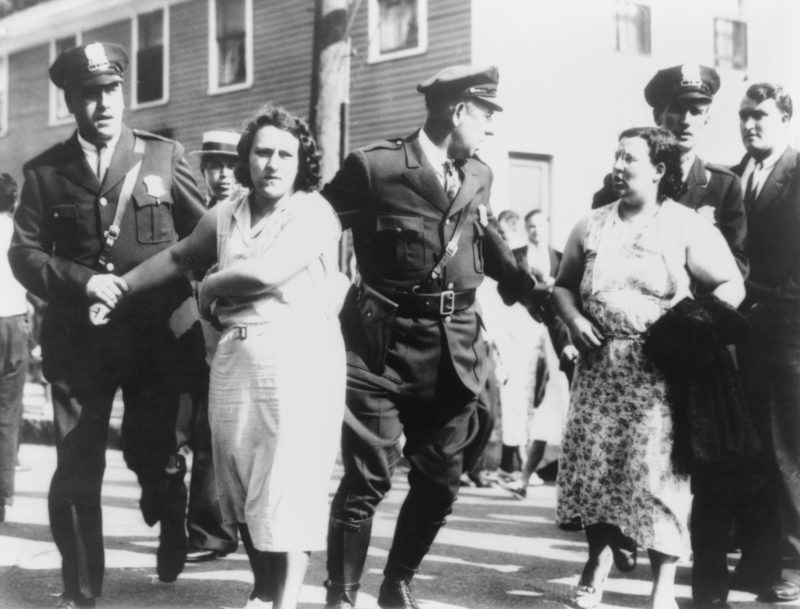 Women textile workers arrested by policemen for picketing the Jackson mill in Nashua, N.H., on Sept. 7, 1934. The concept of the American strike helped create the nation's great middle class. It was no easy process. In the early days of "collective bargaining," some of the biggest strikes in U.S. history were often violent and ineffectual. Regardless, the ability to negotiate one's working conditions has evolved into an American worker's right in the pursuit of life, liberty, and happiness. American railroads were expanding quickly by the end of the 1800s. In 1886, the Knights of Labor went on strike at the Union Pacific and Missouri Pacific railroads, owned by robber baron Jay Gould. The protest officially began when a member of the Knights of Labor was fired for initiating a company meeting in Texas. Unrest quickly spread to Arkansas, Illinois, Kansas, and Missouri. Hundreds of thousands of workers across the five states refused to work, citing unsafe conditions and unfair hours and pay. After several incidents of "union violence," Gould requested military assistance from the governors of the affected states. The governor of Missouri mobilized the state militia. The governor of Texas mobilized both the state militia and the Texas Rangers. The governor of Kansas, however, refused after local officials reported no incidents of violence, despite claims by railway executives that mobs had seized control of trains and rail yards were burning. Ultimately, this strike failed. While the railroad workers themselves protested, engineers and other industrial workers did not join in. And Gould managed to quickly hire nonunion workers. The Knights of Labor disbanded soon afterwards. Some 350,000 U.S. Steel Corp. employees, represented by the American Federation of Labor (the first federation of labor union in the United States) in Pittsburgh, went on strike from September 1919 to January 1920. The protest halted almost half of the country's steel industry. Workers were sick of enduring long hours, poor working conditions, and low pay. This statement is as true as ever “Regardless, the ability to negotiate one's working conditions has evolved into an American worker's right in the pursuit of life, liberty, and happiness.” Despite this, many states continue to push for an anti-union agenda. While many of these states claim to be pro-business they actually hurt the middle class by pushing down wages. States have a history of both hurting and helping labor unions. "For example, in 1806, the Journeyman Cordwainers of Philadelphia were found guilty of a conspiracy in restraint of trade when they struck over wages. But the middle of the century, however, an important decision (Commonwealth V. Hunt) by the highest court in Massachusetts freed unions from the harsh application of conspiracy doctrine. Unions were not engaged in an illegal conspiracy if their objectives were lawful"1. Many businesses would prefer there to be no unions because they would rather have their staff be underpaid. Not all businesses push this because it would drive away qualified workers but business are usually not mandated anything higher than the minimum wage. Gary N. Chaison, Unions in America. (Thousand Oaks, Calif.: SAGE Publications, 2006) 15.